Warning: Always do the breathing exercise in a safe environment (e.g. sitting on a couch/floor) and unforced. Never practice it before or during diving, driving, swimming, taking a bath or any other environment/place where it might be dangerous to faint. 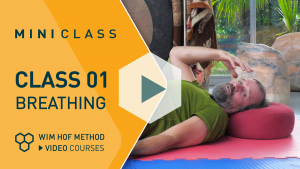 The breathing exercise has a profound effect and should be practiced in the way it is explained. The cold is a strong force. We strongly advice you to gradually build up exposing yourself to the cold. Always train without force and listen to your body carefully. If not practiced responsible, you risk hypothermia or an after drop. Individuals should also not practice cold exposure when pregnant, on an empty stomach, after drinking alcohol, after meals or during exercise. If you have (serious) health issues, please always consult a doctor first before practicing. Available subtitles: EN, NL, DE, FR, ES and PT. This is the last video in the Mini Class. 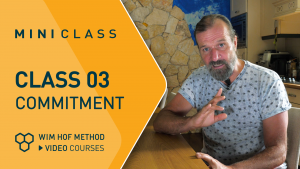 If you're looking to take the next step and learn how to improve your mind-body connection, sign up for the Fundamentals video course and learn to apply the Wim Hof Method to real-world scenarios, including; decreasing stress, handling pressure situations and managing your energy levels. If you’re curious, here’s an animation of the “Brain over body” study that Wim mentioned in the video.